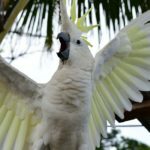 Birds can be noisey and this is especially true with parrots. In the wild birds sing and squawk over large distances to mark their territory and communicate with one another. The problems is that they still do this even if you’re living in an apartment block. If you’re not careful, your neighbours will soon be complaining and what’s more, bird noise can also disturb your own sleeping patterns as well. 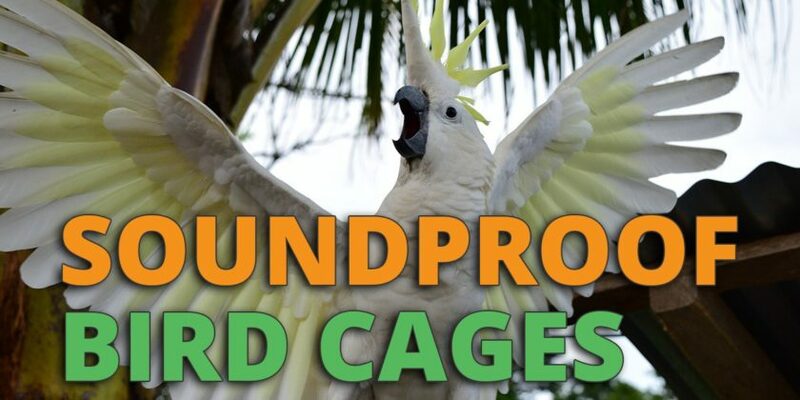 Luckily, there are a few simple steps you can take that will soundproof your bird cage. Normal bird cages have plenty of gaps between the metal bars that allow the sound to freely flow. But a plexiglass bird cage (aka acrylic bird cage) is a thick sheet of bird-safe plastic that will only have a few small holes within the sheet for ventilation. This massively reduces bird noise and is one of the best solutions. It also allows both you and your bird to have a clearer view of one another. We have an entire article on acrylic bird cages here for you to check out. Placed over a cage during the night, a bird cage cover will block out the sun and any night time lights as well. Whilst in the darkness, your birds are more likely to sleep and stay quiet. What’s more, the materials itself also provides an extra layer of insulation protection which dampens the sound of any birds. Bird cage covers are great for night time quietness and to prevent your birds from waking you up in the morning as well. Check out our guide to bird cage covers here. Is your bird cage located in a room that is all hard surfaces? Do you have wooden floors, concrete walls and no curtains? If so, then sound will bounce off hard surfaces more easily. By simply adding a rug, some curtains and a few drapes you will be able to soak up some of the sound your bird makes. These soundproof boards are what musicians use in their recording studios. You can buy them fairly cheaply and then you can simply attach them to your walls for added soundproofing. See the ones available here. You can use these on the windows of your home but also on 1 or 2 of the sides of a bird cage as well. Simply clip or tie them on to the sides to dampen the bird sounds. A range of options is available here. Does your bird really need to be in it’s current location? Perhaps a new area in the house will reduce the noise problem. Areas of the house that tend to work well as a bird room include a conservatory, loft, and even outdoors in your backyard if you have the right climate (and you’re a fair distance away from your neighbours!). At the very least, try moving the bird cage to a wall on the other side of the room. Next time your bird is having a screaming fit and you are in the room, walk out. Wait until your bird has become quiet again. Come back inside the room. Give your bird a treat or reward. Repeat these steps to reinforce quietness and good behavior. So if i went with acrylic could I own a sun conure in an apt? It would only be in there at night and when im at work. While im home ill keep he/she out with me. You’d also want to check the rules of your apartment building/landlord contract/home owner’s association. Some allow pets, whereas others do not. If you’re taking the bird out with you during the day then you might want to consider a bird harness, as shown in our guide here. Also, a bird carrier or travel cage. Plus, since the bird will be indoors you might want to think about full spectrum lighting. Outside is not suitable unless you are 100% sure your neighbours will not be affected in anyway. It is unacceptable that noisy pet owners allow their pets to cause noise nuisance to neighbours and deem this to be fine because they are ‘out in the open’. The supposed excuse for birds is that their are other birds making noise outside. Yes, but not ones that aren’t wild, fixed in one position, not from this climate and so we are not familiarised (able to block out) the noise; their call sounds alien and alarming, on the whole cockatoos, cockatiels and parrots are much louder than domestic birds. Just think people should be aware how much this can affect your neighbours. Thanks for your feedback by looking at it from the perspective of a neighbour to someone with pet parrots. An idea for outdoor parrots is to have some background noise. For example, a water fountain that makes a splashing sound could obscure other noises in the area. Do you have other ideas? Though I do agree that keeping parrots indoors is the best way to prevent noise from disturbing your neighbours.